Tug Daniel Joncaire II, the first of two tugboats to be built by the Great Lakes Shipyard for New York Power Authority – Niagara Project, was commissioned during a ceremony hosted by Great Lakes Shipyard and attended by more than 200 on Tuesday, October 20, 2015. 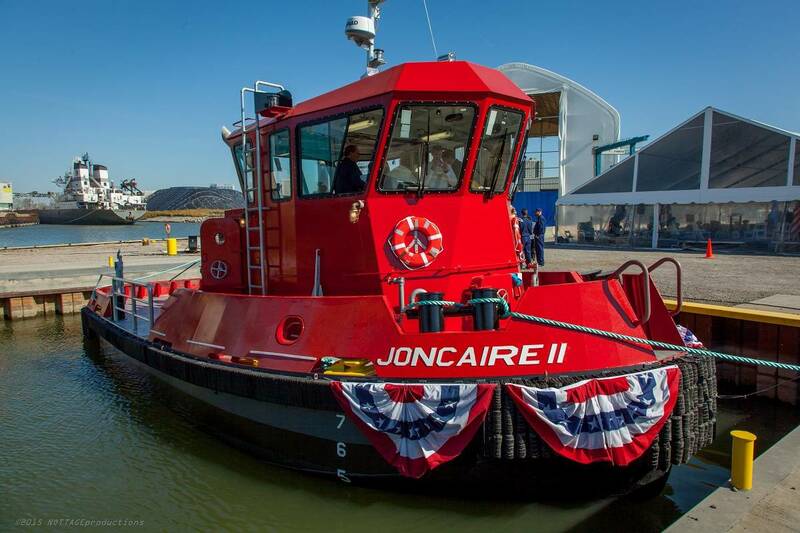 “Today we celebrate the completion of one project and the beginning of another,” said Joseph P. Starck, Jr., President, The Great Lakes Towing Company & Great Lakes Shipyard, as he described the commissioning ceremony of the NYPA tug Daniel Joncaire II and the subsequent keel laying of the new tugboat for Regimen de Pensiones y Jubilaciones del Personal de la Empresa Portuaria Quetzal, Guatemala, Central America. Great Lakes Shipyard was contracted by New York Power Authority (NYPA) to build and deliver two new tugboats for the Niagara Power Plant’s winter operations in Buffalo, N.Y. The new tugs will augment and replace aging vessels that are used for the installation, removal, and maintenance of the Lake Erie-Niagara River Ice Boom and various associated marine construction projects. 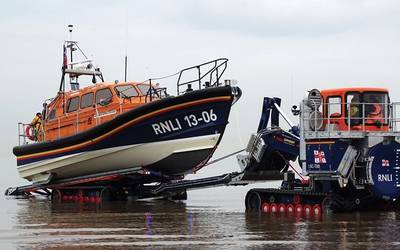 Construction for the first tug began last April, while the second tug is scheduled for delivery in late-2017. The new tugs will be specially reinforced with heavy stems and shell reinforcement for operations in seasonal ice. The design of the conventional drive tugs includes elevated pilothouses for improved visibility when maneuvering, as well as a spacious work deck aft to facilitate ice boom connections. The tug construction contract is the company’s second major order from NYPA. In 2010, Great Lakes Shipyard built the agency’s new 80’ x 34’ Ice Boom Operations Barge, which incorporates a Terex 80-ton pedestal mounted lattice boom crane. A separate ceremony followed marking the keel laying of a new 3,400 H.P. tugboat to be built for Regimen de Pensiones y Jubilaciones del Personal de la Empresa Portuaria Quetzal, Guatemala, Central America (Regimen). 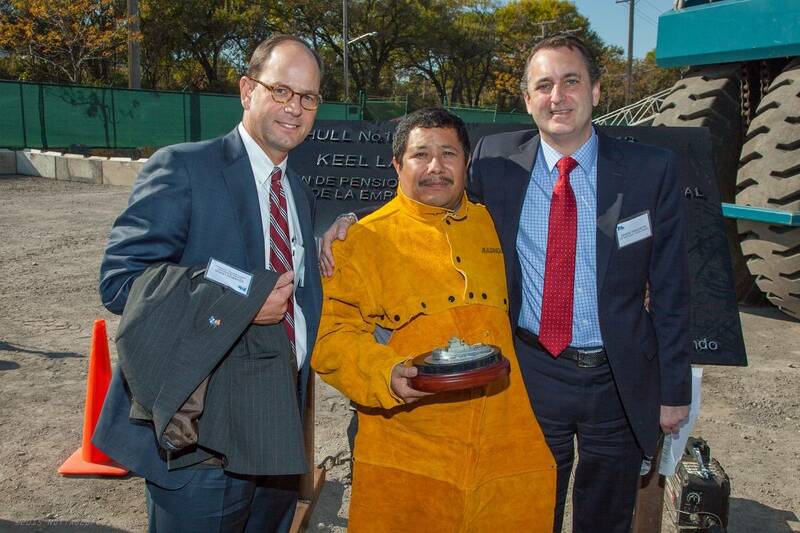 Representing the owner at the ceremony was Eduardo De Jesus Paiz Lemus, Presidente Junta Administrador.